Our clinic uses a machine called the Auto Refract-Keratometer to measure the degree of the myopia, hyperopia, and astigmatism. By this test, you can roughly determine the condition of your refraction. 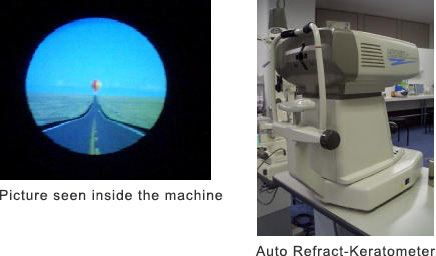 To perform the test, you will gaze at a picture, which can be seen inside the machine. With the machine used at our clinic, you will see a picture of a balloon. ※The refraction test can figure the degree of your visual impairment other than your eye shape, myopia, hyperopia, and astigmatism. The degree will also be the basis to measure your correct vision.